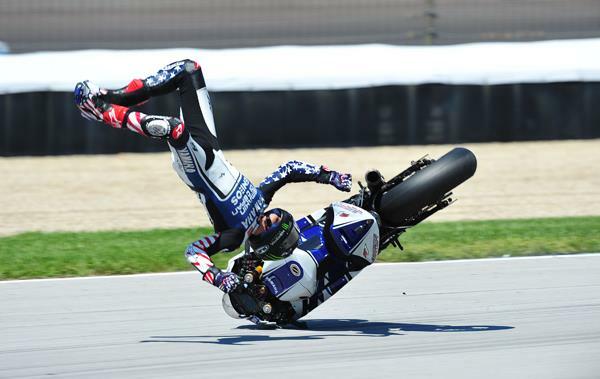 You wouldn’t want to be sitting next to Ben Spies on a plane after the shocking bad luck that struck the Texan in 2012. The switch to fire-breathing 1000cc prototypes was supposed to be the catalyst for Spies to penetrate the elite echelons of MotoGP, which had become the exclusive territory of (Jorge) Lorenzo, (Dani) Pedrosa and (Casey) Stoner. Spies though could not have been unluckier if a meteorite had fallen on his head. A chunked rear tyre in Assen, food poisoning in Mugello, overheating front brake discs in Japan, failed swingarm link in Laguna Seca and a spectacular engine blow-up in Indianapolis meant Spies wrecked more suits than a drunk tailor. A truly miserable season was complete when a crash in monsoon conditions in Malaysia badly damaged his right shoulder and he was forced to miss the final two races of his factory Yamaha career in Phillip Island and Valencia. After the engine blow-up forced him to retire in Indianapolis, Spies told MCN: “There is frustration but it has almost got to a laughing point for me. I'm not even upset about it now. It has been so many things one after another and you just don't know how to respond to it. At Mugello I had food poisoning and that was a bad experience and I tried everything I could there but it was a bad result. Then I was told by somebody in Yamaha that if I'm not going to ride 100% at Laguna don't show up. I went to Laguna and tried the best I could and the bike had a malfunction and I came here with 100% motivation and did the best I could and we had another mechanical with the bike. Spies was also involved in one of the major talking points of the year when he dropped a bombshell on the eve of his home race in Laguna Seca that he would not be riding for Yamaha in 2013. He refused to divulge specific details for his decision, but blamed a ‘litany of reasons’. His decision ultimately handed a lifeline to Valentino Rossi and at one stage Spies looked to be calling time on his MotoGP career. In Indy he said: “If I am racing next year it will be in World Superbikes. But I haven’t decided if I am going to be racing next year. We could have stayed in MotoGP this year but that was not an option for me. I just don’t think I will come back. I’ve raced in every series and I know that there is fun to be had in racing. I know how it is here and I had to try it and it was a dream of mine always to be here but it is not always what it is cut out to be and what people think about it. Here it is very cut throat but it is also the pinnacle of racing so it is always going to be like that. I have raced in every series now and I know what’s fun, and I know how much you can enjoy riding. Spies quickly decided his future was to be in MotoGP and he signed to join rookie Andrea Iannone in the Pramac Ducati squad. It hardly seemed like an inspired career choice for a man down on his luck, but Spies said he had not wanted to turn his back on MotoGP and regretting that decision in the future. He told MCN at the time: “Next year is going to be a big adventure and a big change but for the rest of the year I am still 100% focussed on trying to get good results that I believe all of us deserve. We have shown good speed but unfortunately we have had some problems. I know next year it is big news but right now I don't want to talk about next year too much because I want to focus on what I'm doing for the next two months." When asked by MCN what had convinced him to pledge his future to MotoGP, he added: “I've been in World Superbikes and you never know what you can do if you go back and I’m not saying I could go and win a title or win how many races but I've been there and have done it. I know for me that in MotoGP I don't know what I can do but I know I haven't got the most out of what I can do. I know that and that is why I had to think a lot about it and I don't want regrets in five years knowing that I left something out there and didn't reach my full potential. That's the reason I've done what I have and change is good. It could be a good thing but we’ll wait and see. But right now my focus is to get where I need to be this year and be back at the front."